Damn Scourge of Wrath…even with Black Orb/Shackles I wish I had Divination. However, my fire base with flaming swords has a very good shot at downing him. The fliers would be really key to my strategy in this game as the pyro should be good picking up his little units as well and the Nova Lance could really be impactful. 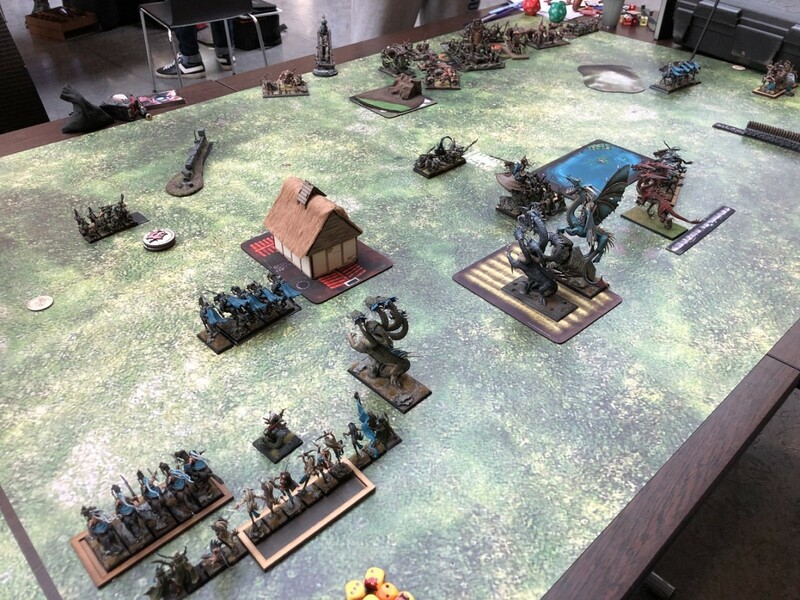 I didn’t love hold the center in this match up as the plague beasts and big slaughterer block were more than a match for any of my units 1-1. I dropped away from the hill with my infantry units set up centrally with the green spears guarding my left flank. My fire base/fliers were centrally located to stay flexible and the Rymas were set to zone units that came out from around the hill. I swung my griff prince around on my left and adjusted the infantry units around while backing the Rymas off from the Scourge. If he wanted to waste Turns 2 and 3 catching them and tying up his advance I was comfortable with that trade off. I repositioned my fire base to shoot at the Scourge. In his turn Micah charged the Ryma knights with the Scourge who fled and outdistanced the beast. 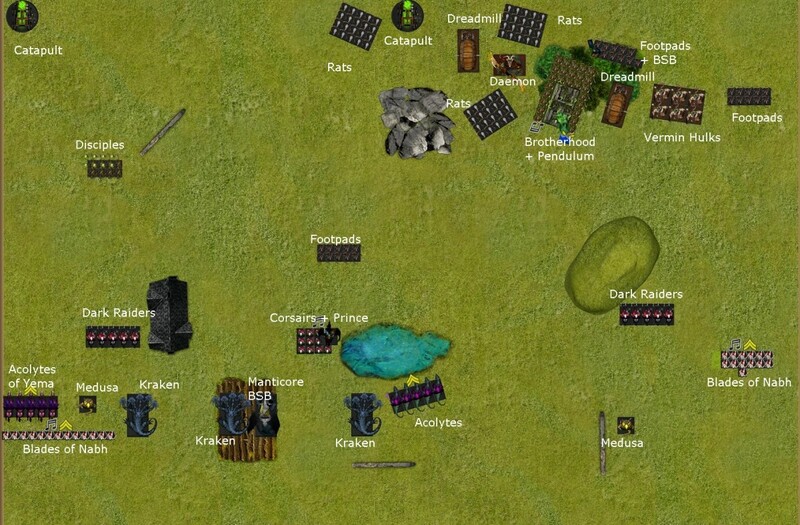 He brings his furies and sky serpents around on my far right flank planning an end run on my shooting base. I rally the Rymas and continue to jockey for position in the center with my Griff Prince and infantry units. The dragon mage repositions to threaten the center but cover my entire fire base with flaming swords. His Slaughterers moved up to threaten counter charges if I charged the plague beasts and his fast movers closed in on my fire base. They would be able to charge next turn. He goes up one on the objective. 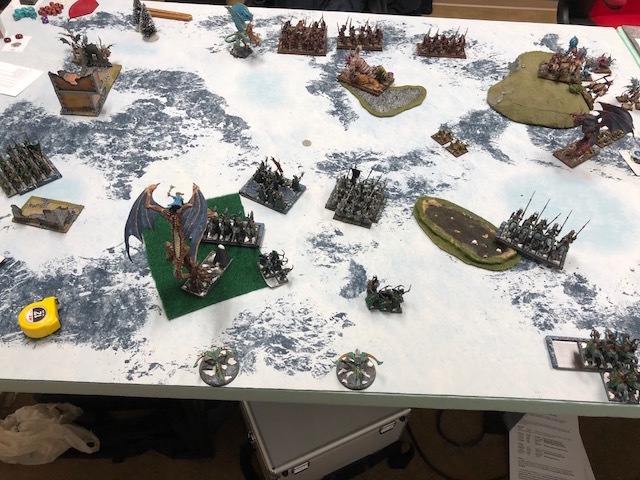 I was able to charge the plague beasts in the front with the Wardens/Dragon Mage and in the flank with the Griff Prince. I did the quick math on this and on average, with no spell support and no lethal strikes from the prince, I pop the unit. I chaff his slaughterers with my reavers on the left. In the magic phase, I made a minor mistake here, I should have split my dice between bubble flaming swords and boosted pyro flow. Instead I split between bubble flaming swords and the hereditary. He stopped flaming swords. After the first four rounds, we’d had a couple of big wins, one marginal win and one marginal loss as a team: this put us still in first place, and in a position to fight for the top spot. 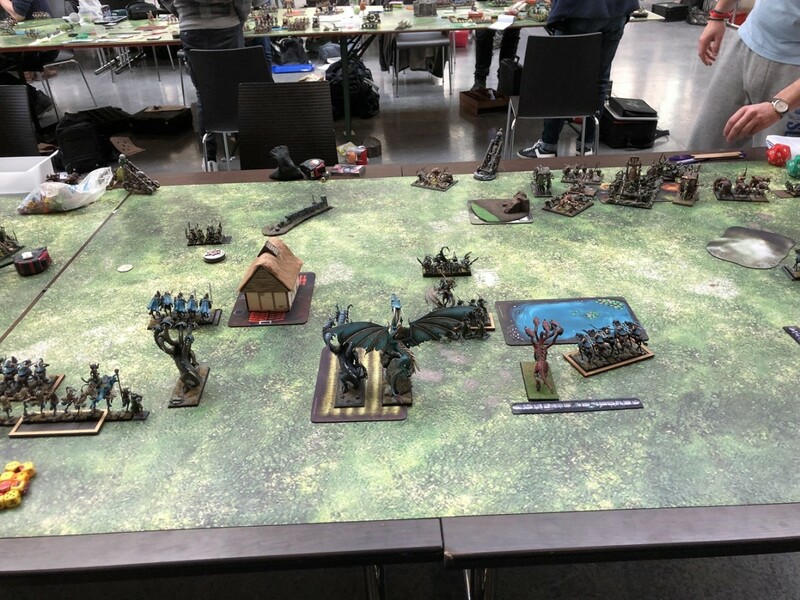 Our opponents were yet another French team, one made up by ETC veterans: They had brought Orcs and Goblins, Dread Elves (a brilliant list with 6 chariots, an altar and two krakens! 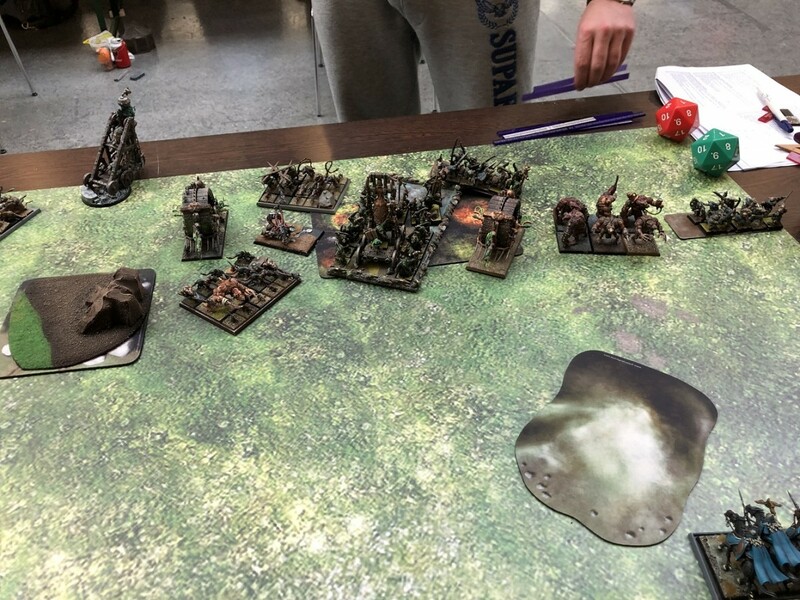 ), Dwarven Holds (Shooting MSU variety), Sylvan Elves (full shooting with Wild Huntsman counterpunch) and, finally Vermin Swarm. Followers of this blog might know by now how much I hate facing the Vermin Swarm. It doesn’t help that our resident Vermin Swarm player is one of the best Belgian players of all time, one who consistently ends up in the top3 of tournaments, from the 7th edition Warhammer days until now. Having played against him several times I’ve learned that elves hate the Vermin, but on the other hand I had a secret hope that not all vermin swarm players would be as talented as Valmir when playing the army. Said hope was shattered when I saw who the player I’d be facing for our last game was: Thibault @ANKOR , also known as the French Mercenary, is a well known face in the European tournament circuit, as the former captain of team France ETC and a very able general. So your run of the mill Vermin Swarm tournament list, with all the tricks: Vermin Daemon for reliable Discipline bubble, Divination magic and an almost unkillable general, the Pendulum unit to keep things honest, two Dreadmills to get points from the big targets, two catapults for whittling down the R3 elves, and a smattering of scoring and chaff. The objective for this round was Secure Target, and we got Counterthrust deployment. For spells, I went with the usual Ice and Fire/Crippling Fatigue and Grave Calls/Breath of Corruption, while my opponent picked the VS hereditary, Fate’s Judgment, Unerring Strike, Scrying and Stars Align for the Vermin Daemon. The Plague priest took Pentagram of Pain and Hand of Glory. Going into the game I knew that coordination of the attack was key to standing a chance: if I allowed the dreadmills and the magic users enough time to kill my big targets one by one I’d go down fast. I won the roll for sides and gave my opponent the side with the impassable terrain, placing my Secure Target token to the far left: that side of the board had enough covering terrain to ensure that if my adversary wanted to go for it he’d have to give me a lot of hiding spots. Thibaut countered this by placing his token diametrically opposite, right next to the eastern table edge. I placed one Blade unit on either side, careful to prevent any easy firing lanes to the catapults (they had been placed already). 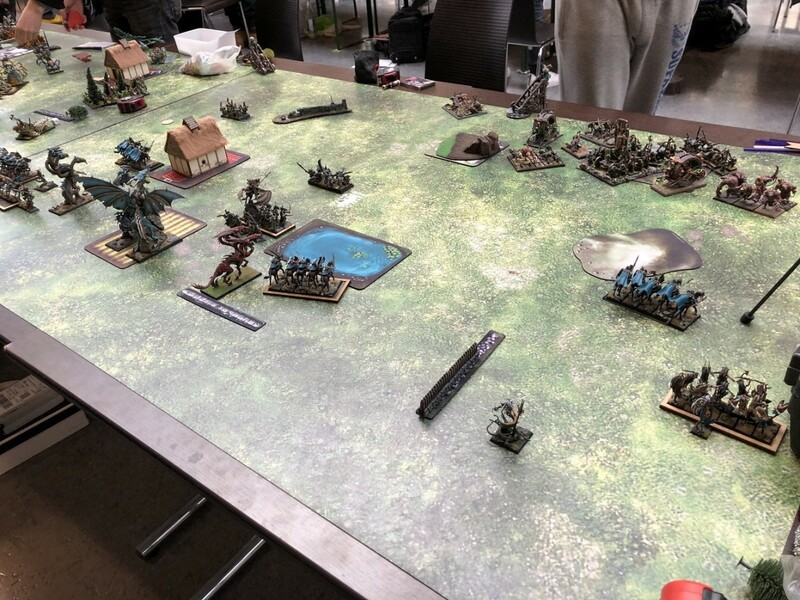 The krakens and manticore went off-center to the left, and the general with Corsairs deployed dead center so as to be able to threaten either side of the board. My opponent replied to this by completely abandoning the left flank, and deployed in a denied flank using the impassable terrain to protect his flank. This approach meant that I was all but guaranteed a draw objective-wise as long as I managed to deal with the disciples early on. But storming the Vermin battle line and winning the secondary would be a totally different story. Predictably, the Footpads vanguarded forward to block my prince’s vanguard, and I moved up with both fast cavalry units.